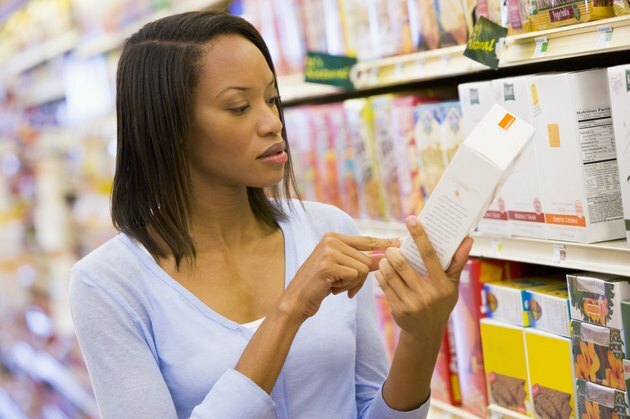 Why Is Reading Food Labels Important? All packaged foods come with a nutrition label meant to provide you with the information necessary to know exactly what you're eating. Understanding what's in the foods you eat helps you make healthier choices. Checking food labels also makes it easy for you to compare the nutrient content of different options. A healthy diet is crucial throughout your lifetime and paying attention to nutrition labels is a good step toward improving your overall diet. The nutrition label provides key information such as serving size, calories, total fat, saturated fat, cholesterol, protein, carbohydrate and vitamin content. The label also contains a list of the ingredients. This information helps you stay on track with your daily targets. It also helps you avoid certain ingredients if you have a food intolerance or are following a diet that excludes certain components, such as dairy. Typically, Americans consume too much salt, saturated fat and added sugar. Checking nutrition labels so that you know what and how much you're eating plays a central role in being able to cut back on your intake. It's recommended that you cut back your sodium intake to less than 2,300 milligrams per day and your intake of added sugar and saturated fat to no more than 5 to 15 percent of your daily calories, according to the Dietary Guidelines for Americans 2010. Check food labels for guidance as to how to reach your goal of cutting back on these components. Despite a wide variety of available nutritious foods, many Americans fail to eat recommended amounts of key nutrients. For example, it's recommended that you increase your intake of dietary fiber. Aim to get 25 grams of fiber if you're female and 38 grams if you're male, according to the Dietary Guidelines for Americans 2010. Checking food labels for the fiber content plays a role in helping you increase your intake. For instance, not all brown breads contain rich amounts of fiber, and some manufacturers use coloring to make bread look healthier, so it's crucial to read the label. It's crucial to determine your nutrition goals first, so that you can make the best use out of food labels. For example, if you're overweight, comparing the calorie content of various options allows you to choose a low-calorie, nutritious item to stay within your daily calorie goals. The information on serving size is particularly important since the nutrient information listed on a label is often for more than one serving. Another example is if you have a chronic condition. For instance, if you have high blood pressure, it's crucial to pay attention to the sodium content. What Are the Main Counseling Points for Diabetes Type 1 & Type 2? How Much Bread Do I Need Each Day?